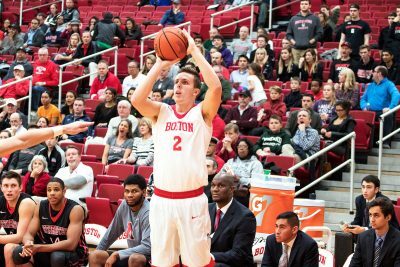 The Boston University men’s basketball team traveled to Bethlehem, Pennsylvania, Saturday to take on conference foe Lehigh University. The Mountain Hawks (13-6, 6-2 Patriot League) beat the Terriers 97-78, avenging an 82-88 Patriot League quarterfinal loss from last season. It was the Terriers’ (9-12, 2-6 Patriot League) fourth straight defeat, as a furious second half comeback fell short. Lehigh came out of the gates firing making four straight shots, scoring the first nine points in the first three minutes of the game. The Terriers were ice-cold in the first five minutes of play, shooting 1-for-6 from the field with a lone bucket coming from junior forward Tyler Scanlon. BU’s struggles continued into the eight minute media timeout as the Mountain Hawks held a 35-16 lead. It was a downpour of threes for Lehigh as the team was shooting 7-for-11 from beyond the arc. The Mountain Hawks shot 79 percent from the field in the first half, with guard Jordan Cohen shooting a perfect 4-for-4 from the field. Lehigh held its largest of the first half heading into the locker room, up 25 points, 57-32. For the Terriers, junior forward Max Mahoney, who has averaged 19.4 points per game in Patriot League play, was held to two points at the half. Sophomore guard Javante McCoy led the Terriers at the half with 13 points. BU turned up the aggression in the beginning of the second half, with Scanlon providing a spark for the Terrier offense netting six points in the first five minutes of the half. Yet the Mountain Hawks were relentless on their offensive end, shifting their play from the perimeter and jumpshots in the first half to inside passes and alley-oops early in the second half highlighted by an and-one bucket from center Nic Lynch. With nine minutes left in the game, the Terriers seemed to be gaining some momentum as Lehigh’s lead was cut to 17 points. Redshirt freshman guard Alex Vilarino had scored five quick points as the Mountain Hawks began turning the ball over. Vilarino and Mahoney cut Lehigh’s lead down to 10 with six-and-a-half minutes left to play. Despite this second half comeback, though, the Mountain Hawks would finally pull away and hold on for the win, 94-78. Lehigh’s Cohen led all scorers with a game-high 32 points. finished the game with a team high of 20 points. Jones said he believes the team can pull through its string of losses. “As long as our staff keeps battling, we’re going to make it to the other side of this,” Jones said. The Terriers will return to Case Gym Jan. 30 for a bout against the College of the Holy Cross in a battle for the Turnpike Trophy. I’m sorry but it’s sad what’s become of the program. Quite strange that a student paper with the reputation of the Daily Free Press has offered no editorial opinion in years, positive negative or indifference, on the status of the program.